The visual difference to our church since demolition work began is obvious, but have you noticed any aural (sound) difference? The removal of the carpet has changed the acoustics of the building. Soft furnishings, like carpet, absorb sound, while sound bounces off hard surfaces like brick, timber and stone. The result is an increased resonance of sound throughout the church, which enlivens the output from the sound system, organ and musical instruments. Good acoustics are also important so that we can hear each other. Being able to hear those around us pray and sing gives us confidence and reminds us that the liturgy is a communal, rather than individual act. If we can’t hear others, it feels like we’re cheering on our team at home in front of the TV, rather than at the stadium with thousands of other fans – there’s a big difference in terms of sound and experience. Feeling like you’re the only person in the church singing is not very encouraging! While our renewed church will have some carpet, there will be less of it. Some spaces that were carpeted will be tiled instead. This means the acoustic feel of the church will change again, but will not be as dull as what it was before. We’ll need to wait and see what the difference will sound like. You will have noticed that this column in Carmel has been different in recent months as I have been in Europe. As anyone who has been there knows, it is impossible to travel through that part of the world without seeing churches. It is important for us to express our particular identity as part of the Carmelite family. 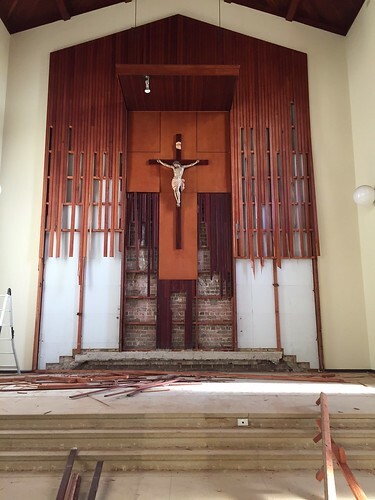 This Tuesday, our architect Jesse Mowbray will present to Fr Paul and the rest of the Church Renewal Committee the three potential design concepts he has prepared for the renewal of the liturgical space. In the weeks that follow, the committee will engage in a process of discernment to settle on a single design concept that it will commend to the Pastoral Council, Carmelite Provincial Council and Bishop Anthony. The concept can then be presented as the proposed design once formal approval is received from Fr Denis (Prior Provincial) and Bishop Anthony.